I have about 15 things on my mind right now, but I have decided to blog about something most of us can relate to and need to do, saving money. I am going to share a handful of my grocery-related suggestions. I would love to hear what all of you do and how you feel about my ideas. Here goes! I shop at Giant Eagle and take advantage of double coupons as much as possible. Thanks to doubled $.50 and $.75 coupons, I have gotten things like toothpaste (Crest or Colgate), toothbrushes, shaving cream, and rice for free. I have paid $.50 for yogurt multi-packs and soup. And I have paid far less for some items than I ever would have had I bought them at the dollar store, a warehouse club, or Aldi's. My strategy is to hold on to the big coupons until the item goes on sale. If it is a product I regularly use and the coupon is about to expire, then I will probably end up using it regardless, because I am still saving money. "If I actually publish this post, I am pretty sure some friends will be calling me with great concern" "Where is my happy place" "I can't cry hard enough""Missing person""Paralyzed by fear" As for the first title, well, it is probably obvious that when that post was swirling around my head, I was pretty down. Fortunately, that post never came to fruition. Sexism or a big rip-off? Coming on the heels of my last post, I have another customer service issue. Except this appears to be less about customer service and more about my being a woman. It seems to me that expressing thankfulness has gone by the wayside. Or, at the very least, people showing their appreciation is more the exception rather than the rule. Apparently, it is too much for the people checking me out at Giant Eagle to say thanks (in all fairness, I don't live near one of those fancy-shmancy Iggles, where perhaps they do say thank you). It is not as if I am looking for "have a nice day." Just a simple, even if insincere, thank you would do. But considering that most of the cashiers don't even bother to speak to me, I am probably asking for the impossible. Kennywood! Kennywood! Kennywood! Kennywood! Kennywood! Kennywood! Kennywood! 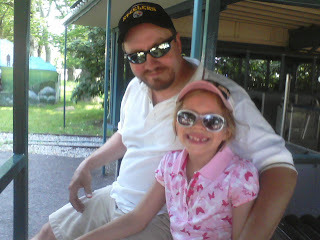 Yesterday, Bri, J, and I went to Kennywood to celebrate J's excellent grades this year. The last time I was at Kennywood was in 2000, when the Aero 360 first opened. I won a contest on the now-defunct B94 and was one of the first few people to try out that new ride. Even though my body started rejecting spinning/turning movements back in the late 1990s, I managed to employ mind over matter for that experience. The last time I had spent an entire day at Kennywood was back in 1994 or 1995, when Bri and I were just dating and had gone with one of my friends from high school and her boyfriend. Back then, I could ride all things that spin, twist, turn, or loop. The good ole days! Watch out, Jackie Joyner Kersee! Last week, on the last day of school, Jordan got into the car with some certificates from awards day. She handed me the one she was "most proud of"--a certificate for athletics. I scanned it as I came to a stop sign, and I at first thought she had won an award for being the most athletic. This immediately caused flashbacks to childhood, during which I was pretty much the slowest and most non-athletic kid in the class. I was in slightly better shape as I entered high school, but mostly still just skinny and completely devoid of grace. And pretty much almost always picked last for gym class. (See an old blog post about that.) Because of these unpleasant memories, I decided right then and there a photo of Jordan's certificate would be going up on Facebook, so all my former classmates could see that my kid was nothing like I was. She had hope! Tonight's meeting was held at Frick Park. On our way to the three areas we were to visit, all the treehouses the kids had created from that last meeting flanked the pathway. I thought it was pretty cool. Jordan is standing near hers. Not nearly as cool is my shadow!